A world-class electronic waste recycling company, All Green Recycling, is now operating in this city to provide convenient E-Waste Management Solutions. Recycle and remarket old electronic products through the solutions provided by All Green Recycling. 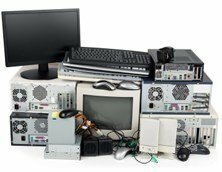 Disposing of retiring tech equipment should be done according to standards and principles set by EPA. If you want to stop the risks caused by data hacking then have our Data Destruction service today. Destroying end-of-life IT equipment should be done to mitigate the risks triggered by data breaches. Are you looking for a responsible way to recycle your old electronics? There are a lot of e-waste solution companies in the country but choosing the best one is somehow difficult. Recycling old devices is a daunting task so is finding the right service provider. However upon landing on this page you discover one provider – All Green Recycling. We’re in this business for many years already. Our capacity has been molded through the years of excellent service. Today you can try our Electronics Recycling Turlock Services which are designed to provide efficiency and convenience. Turlock is the second-largest city in Stanislaus County with 68,549 residents. It is home to California State University, Stanislaus, a liberal arts university that is part of the California State University system. The list below contains the specific products which you can let us recycle, reuse, and even remarket to regain extra income. Instead of transporting your e-waste products abroad for irresponsible dumping in the landfills there, you can embrace the system which our company is promoting. The ITAD solutions that we have are crafted with commitment to render the needed services. 7 days a week we are ready to cater to your needs wherever you are in this city. Our pickup trucks are always read to pick up and transport your products from your own facility going to ours for the initial treatment processes. We also have a wide network of recycling partners who are professional in terms of providing a world-class electronic waste recycling solution. Our remarketing service is designed to allow you to earn a maximum of 70% from the net reselling revenue. You don’t need to spend your own money because our services (from pickup to refurbishment of your items) are free of any charge. If you want to know more relevant information, please feel free to contact us anytime.